*KAZOOP !! : 1970: A LOOK AT THE FIRST YEAR OF COR!! Hi and welcome to my blog about comics from other people’s childhood! It is dedicated primarily to British humour comics of the 60s and 70s. The reason they are not from my childhood is simply because I didn’t live in the UK back then (nor do I live there now). I knew next to nothing about them until fairly recently but since then I’ve developed a strong liking for the medium and amassed a large collection, including a number of complete or near complete sets. My intention is to use this blog as a channel for sharing my humble knowledge about different titles, favourite characters and creators as I slowly research my collection. QUICK TIP: this blog is a sequence of posts covering one particular comic at a time. The sequence follows a certain logic, so for maximum results it is recommended that the blog is read from the oldest post up. Copyright of all images and quotations used here is with their respective owners. Any such copyrighted material is used exclusively for educational purposes and will be removed at first notice. All other text copyright Irmantas P.
1970: A LOOK AT THE FIRST YEAR OF COR!! 30 issues (Nos. 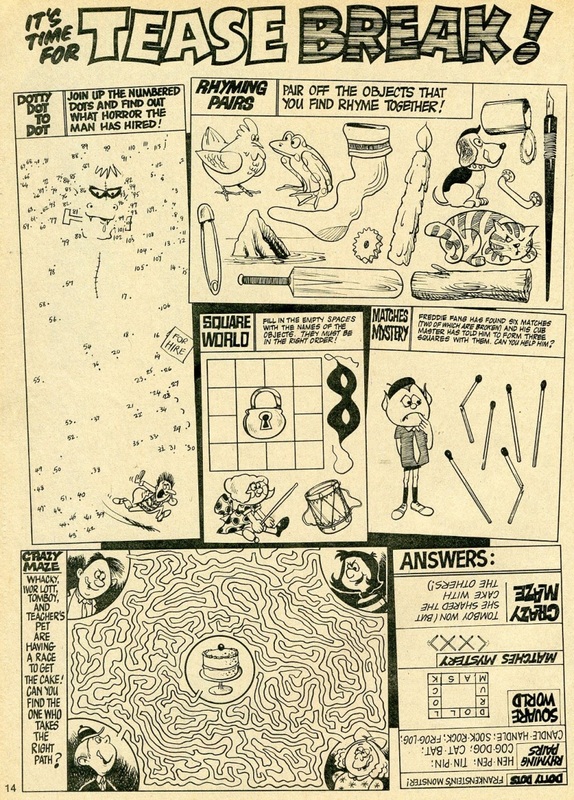 1- 30) of the comic were published in 1970. The first three issues of COR!! came with free gifts: the first one had a sachet of GULP fruit drink mix; easy to follow instructions were provided on page three. The second issue had a double gift – Super Anglo Bubble Gum and 2 instant picture sheets of Letraset Dry Transfers – eight figures in full colour. No. 3 came with a Super Mystery gift. What is it? – Squeeze Gently and See – said the text on the gift. It was one of those cardboard sleeves with a rubber band and a metal hoop inside that made a rasping sound as it spun around inside the envelope. 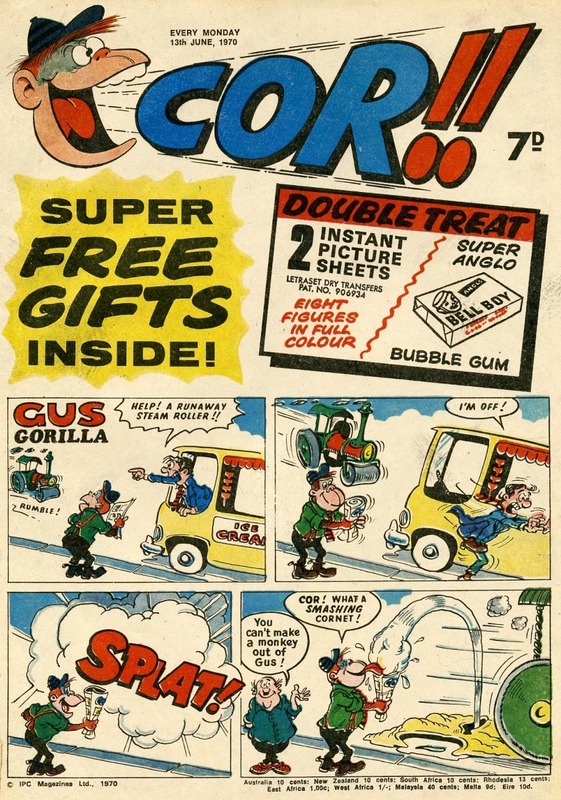 I am not sure if this was the first time that FLEETWAY or IPC used it for a free gift but it surely wasn’t the last: they even re-used it with the same comic only some two and a half years later (Cor!! issue dated 6th October, 1973 (No. 175)). This was quite a strong line-up from the very start. A number of the features such as Gus Gorilla, The Gasworks Gang, Hire a Horror, Tomboy, Football Madd Ivor Lott and Tony Broke (of course!! ), Andy’s Ants and Teacher’s Pet survived the entire 4-year run of the comic; three of them – Ivor Lott and Tony Broke, Football Madd and Tomboy even survived the demise of COR!! 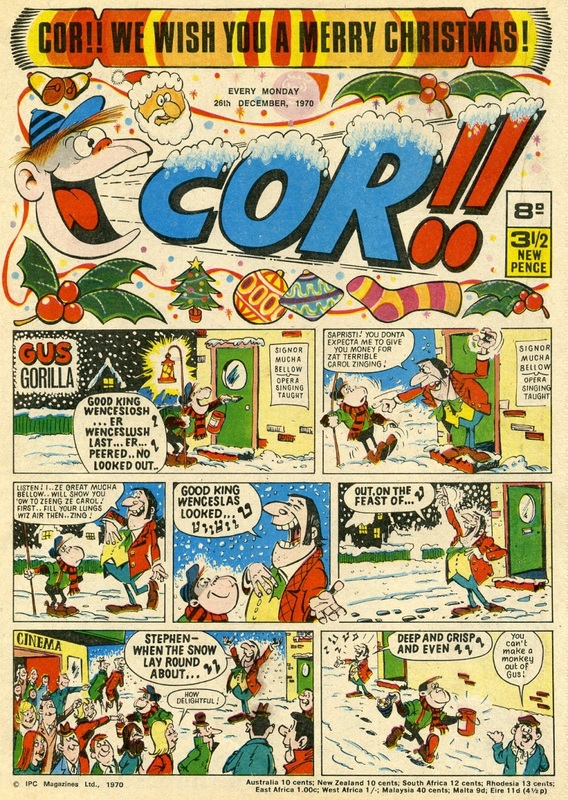 Quite a few others such as Kid Chameleon, Spoilsport, Eddie (who was always bored), Donovan’s Dad, Freddie Fang, Tricky Dicky and Whacky enjoyed long runs in COR!! Individual strips won’t be covered in this post because I plan to devote a separate one to each and every one of them in the future (hopefully). 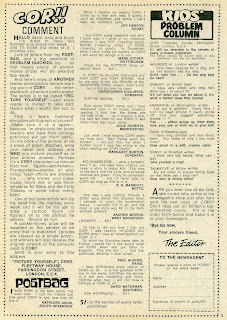 There was an anonymous welcome message on page three of the first issue. Starting from issue 3 the column got the name of COR!! MENT and was signed by the Editor. In the early issues the Editor mostly used the space to build the hype by telling readers how great the comic was doing and how much reader mail they were getting, always urging to send in more. The Editor also addressed some practical issues, e.g. he explained why there was not going to be a Holiday Special in 1970 and apologised for not having enough time to prepare a 1971 annual; on more than one occasion he explained how due to production process it was not possible for readers to send in jokes and letters one week, and have them published in the NEXT issue; in the issue dated 3rd October, 1970 (No. 18) he broke the bad news that the price of COR!! was to be increased by one penny to meet the rising costs of production; in Firework issues he urged to follow the Firework Code and pointed out the most important rules to be observed. He dropped hints about new stories in the making and plugged next week’s extra-special bumper editions. But let us get back to the first issue. In the welcome message (that would soon become the COR!! COMENT Editor’s column) readers were encouraged to join in the fun by sending their entries in the NUTTY NOTICE BOARD – jokes, riddles, puzzles, limericks, tricks – anything amusing. Contributors were offered cash prizes if their submissions were published. 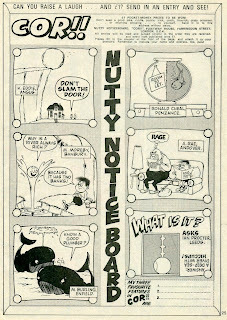 Surprisingly, the NUTTY NOTICE BOARD feature premiered in the very first issue of the paper, complete with names of the lucky readers who collected £1 pocket money each. The welcome word in the first issue also introduced KIDS’ COMIC PROBLEM COLUMN – “another great fun feature” earmarked for the second issue. Readers were invited to send in their problems while Cor!! promised to offer some advice… and even if the advice doesn’t help, the cash prize for the published items will! – said the call for contributions. Each week the Editor would choose one Problem of the Week and offer “counselling” in illustrated form. 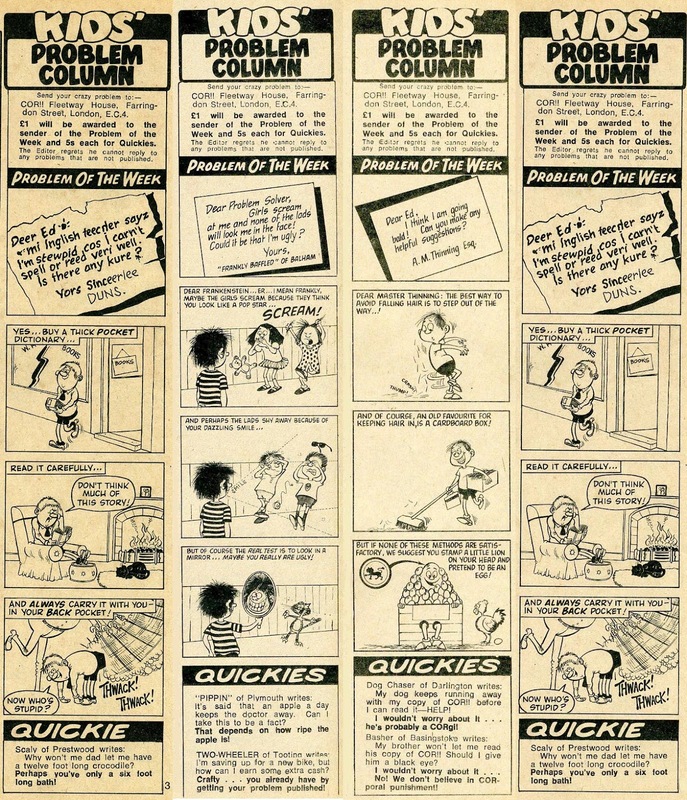 One or two (sometimes more) deserving problems would be addressed in the Quickies section in a simple “question-and-answer” format, always showing how witty the Editor was and never missing an opportunity to plug the name of the comic. Due to lack of space, the Editor would occasionally skip Problem of the Week, leaving just Quickies. Illustrated Problem of the Week continued until the issue dated 17th October, 1970 (No. 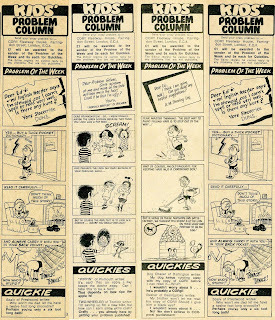 20), afterwards illustrations were dropped and the feature became simply Kid’s Problem Column or Problem Quickies. There was a voting coupon for writing down your three favourite features and sending them to Cor!! It’s a shame that editors never shared information about how different strips were faring. 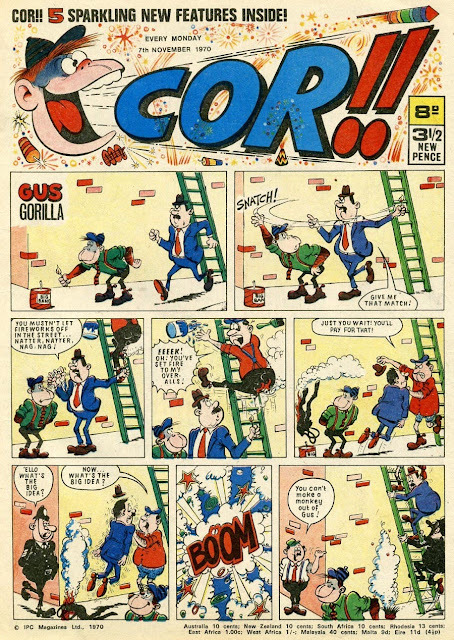 It isn’t difficult to guess that the strips which were dropped quickly weren’t doing well in the popularity charts. On the other hand readers’ letters and the Editor’s comments printed in the Postbag section left little doubt about who the favourites were, but I for one would have loved to follow a Top 10 chart and its developments over time. In fact, one reader whose letter was printed in the Postbag feature told how she was doing a graph of the stories liked best by COR!! readers, taken from letters she read in POSTBAG. 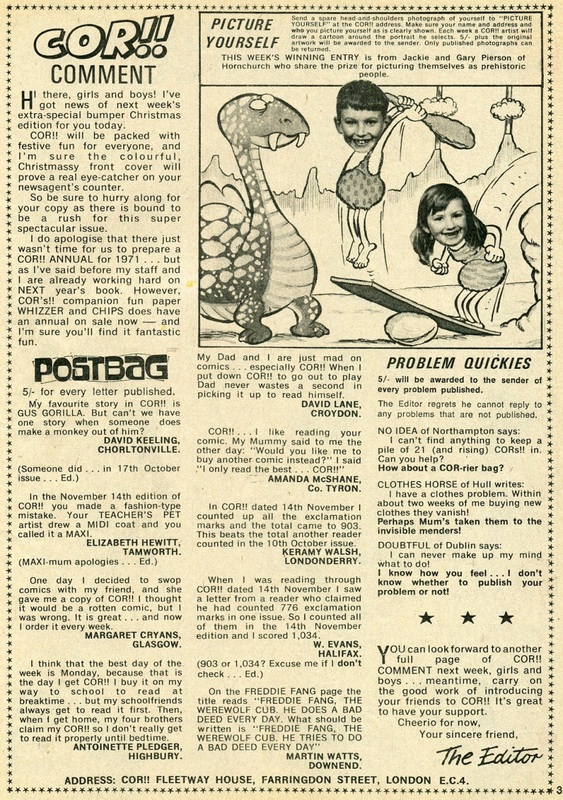 Postbag reader participation feature was promoted in the first four issues and made its debut in the issue dated 4th July, 1970 (No. 5). Again, pocket money prizes were offered for every item published. The first prizes went to readers who wrote in to tell how much they liked the comic, how fantastic and side-splitting fun it was, what their favourite features were, how they placed a regular order or how their friends or relatives were like Cor!! characters. Soon, however, readers realized more effort was required to get their letters printed. Several ardent fans wrote in to tell how they named their pet after a favourite Cor!! character or compiled lists of words that started with COR. Others pointed-out mistakes they had spotted in Cor!! strips (e.g. drawing a MIDI-coat and calling it a MAXI). But a new and truly weird trend started in the issue dated 14th November, 1970 (No. 24) with a contribution by Andrew Morris of West Bridgford who counted all exclamation marks in an earlier issue of Cor!! The overall stats were 776, with Gasworks Gang having the greatest number of 62. WOW!!!!!!!!!!! – was all the Editor had to say in response and Andrew collected his pocket-money prize of 5/-. Other readers joined in and before long they were counting and re-counting exclamation marks (with two readers coming up with considerably different sums for the same issue – but presumably both pocketed their prizes), sound effects and noises, ants on the Andy’s Ants page, fireworks in the Firework edition, presents in the Christmas issue and Easter eggs in the Easter issue, stars framing the POSTBAG page, words printed in the comic and the number of actual letters in all and even the number of letter “C”s in an entire issue. One reader bothered to count the number if characters’ legs in the comic (1,350 legs). Phew!.. 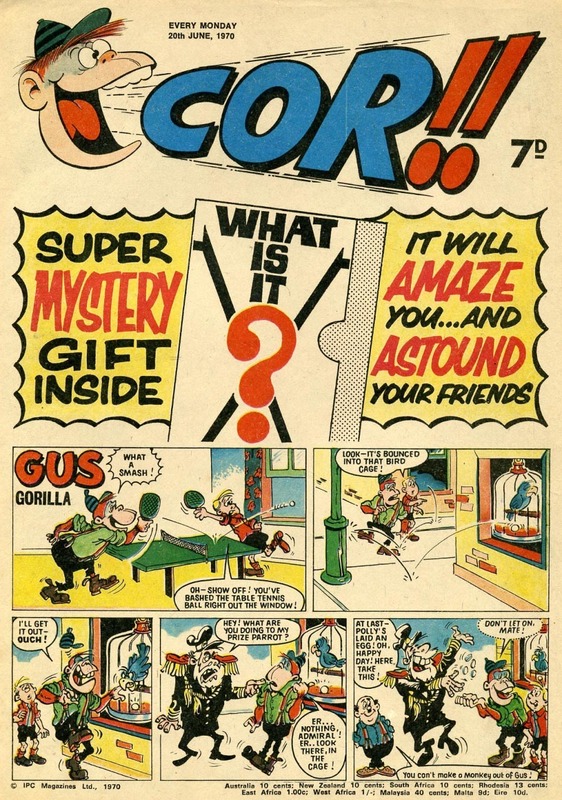 Counting mania remained prominent in readers’ mail during the entire run of the comic. POSTBAG section was apparently proving a big success, some readers even mentioned it as their most favourite feature, demanding that it be given more space. The Editor always seemed to be keen to devote as much room as possible to Postbag, but ½ or 2/3 of a page was the maximum he could afford at that stage. Further two reader participation features were added in 1970. TEASE BREAK! debuted in the issue dated 17th October, 1970 (No. 20) with as many as two pages of puzzles. In his COR!! MENTS column the Editor said the feature was included because so many Cor!! readers had written in and requested it. TEASE BREAK! became a regular one-page feature (with an occasional extra page) from the issue dated 7th November, 1970 (No. 23) and continued to appear in Cor!! on a semi-regular basis until the end of the comic’s life. 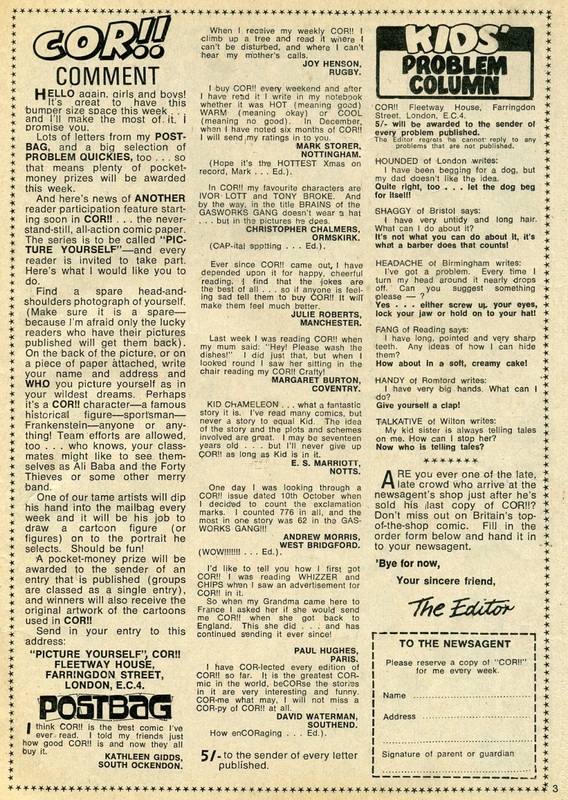 In issue 24 (14th November, 1970) the Editor announced plans to launch a new feature called Picture yourself and provided a detailed description of how it was going to work. Cash prizes were offered again. The first winner in the brand new Cor!! participation feature was announced (and had his portrait printed) in the issue dated 28th November, 1970 (No. 26). Form that issue onwards the feature stayed on the pages of Cor!! until the demise of the comic in 1974. 1974: A LOOK AT THE LAST MONTHS OF COR!! 1973: A LOOK AT THE FOURTH YEAR OF COR!! 1972: A LOOK AT THE THIRD YEAR OF COR!! 1971: A LOOK AT THE SECOND YEAR OF COR!! SOME VERY EXCITING NEWS FOR FANS OF KEN REID!